Google, Apple hoping 7 will be the lucky number in 2013? Whereas the race between smartphone manufacturers like Apple, HTC, Samsung, Nokia, et al. 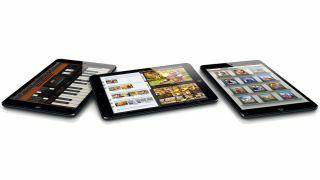 has been to see which can create the larger, more powerful device, the tablet battle is another story all together. Where 10-inch tablets once ruled the roost, the tides have seemingly changed in favor of smaller 7-inch devices, with the iPad mini and Nexus 7 leading the charge. Apple and Google are well aware of the shifting currents, and according to DigiTimes, will ramp up efforts to take control of the 7-inch market in the second-half of 2013. With Microsoft and other players expected to step into the smaller arena, the later half of the year could be an interesting one for the sure-to-be heated tablet wars. Google and Asus are believed to be readying a new Nexus 7, complete with Qualcomm processor, for the Mountain View firm's Google IO event later this month. After selling approximately 4.5 million Nexus 7 tablets since it launched in late 2012, Google is eager to get the second generation of its popular Android tablet out by this July. That would certainly give Google a leg up on Apple, which has DigiTimes sources say sold 12.5 million iPad minis (out of 19.5 million iPads total) in 2013 alone, and is also believed to be working on an iPad mini 2. DigiTimes' insiders claim Apple won't be ready to release the iPad mini 2 until August, which coincides with rumors we've heard before, but with 63 percent of all iPads sold reportedly being of the 7-inch variety, there's could be a market very hungry for a smaller iOS tablet. Microsoft was a bit late to the party with its Windows 8 and Windows RT tablets, but could establish a stronger foothold when it too brings a 7-inch version to market later this year. Asus and Acer have also recently released smaller tablets to capitalize on the trend, but have maintained an air of quietness due to low pricing, which both companies believe could affect the respective brand image. Though Asus and Acer may not be bragging about their new tablets, both companies are reportedly busy putting together new Chromebooks for the second-half of 2013. Despite a supposedly fledgling market, Acer hasn't given up on the Chromebook market yet, according to more DigiTimes sources. While sales on Acer's current 11.6-inch Chromebook have dipped since the beginning of 2013, sources indicated a new version was being prepped for July to target new students. Asus is also reportedly eager to grab a part of the Chromebook market, and is believed to be developing a laptop of its own for release in the latter half of the year. Not to be left out, Samsung, Lenovo, and HP are also said to be in talks with Google to create new Chromebooks, and along with Acer and Asus, the five are all working on Androidbooks as well. We should have some light shed on the whole situation starting May 15, when Google IO gets off and running, but from the sounds of it Google, its OEMs and Apple are very busy tinkering away at new products, ones customers are apparently very keen on.